晓 阴 无 赖 似 穷 秋。What can I do with an autumn-like vernal hour? 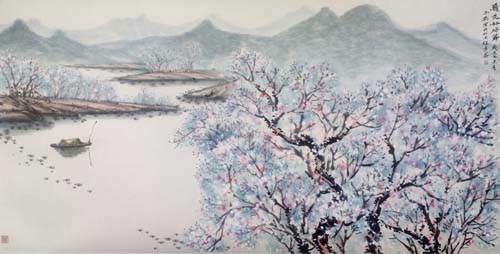 淡 烟 流 水 画 屏 幽。I see on painted screen but a mist-veiled running stream. 无 边 丝 雨 细 如 愁。The boundless drizzling rain resembles a tearful look. 宝 帘 闲 挂 小 银 钩。 The broidered curtain hangs idly on a silver hook.